The operating subsidy for the railways averages £2.5 billion per year for the period back to 1954. Since there is and always has been operating subsidy it is unreasonable to expect loans or capital expenditure to be repaid from the fare box. Instead the capital and loans should be added to subsidy as though both were current expenditure. In the 20 years to 2015 subsidy to rail, including capital expenditure and loans guaranteed by the Government, is likely to amount to £100 billion.. Our sources for that are National Rail Trends, the White paper with the title ‘Delivering a Sustainable Railway’, July 2007, the proposed expenditure on Scottish railways (excluded from white paper), and Network Rail’s annual reports. £156,000 per year per track-km (£250,000 track-mile). 8 pence per item-km if freight and passengers are added together. In contrast to the bottomless pit that the railways are the Treasury takes close to £50 billion annually from motorists. That is made up of, fuel Excise duty, VAT on fuel, Road Tax, VAT on new cars, company car tax and Insurance Premium tax. £50 billion is equivalent to £2,000 per household. Deducting annual expenditure of circa £9 billion yields a net tax take of £41 bn, corresponding to a net annual take of £1,600 per household. Tax take or profit per lane-km, £240,000. Profit per passenger-km, 6 pence. Profit per item-km if passengers and tonnes are combined, 4 pence. 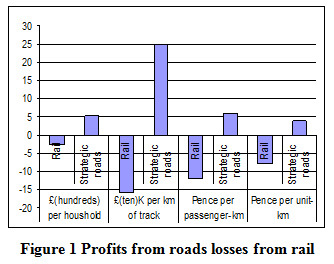 The bar chart below enables the astonishing losses from rail set out above to be compared with the corresponding profits to the exchequer that may be attributed to the strategic road system. "Statutory contingent liabilities in support of Network Rail"
Table 5.5 Travel by household income quintile and main mode: 2004. (Source: National Travel survey with London Underground and Surface Rail disaggregated by special request to the DfT). Bulletin of Public Transport Statistics 2004. (Note at the time of writing the 2005 edition is available on the web but will be void of financial data until late November 2005).